Do you have a cool million dollars sitting in your retirement account? If not, you probably need to keep saving if you’re planning on retiring in one of America’s largest cities. Thanks to the rising cost of living in urban areas across the country, retiring in a big city is more expensive than ever. 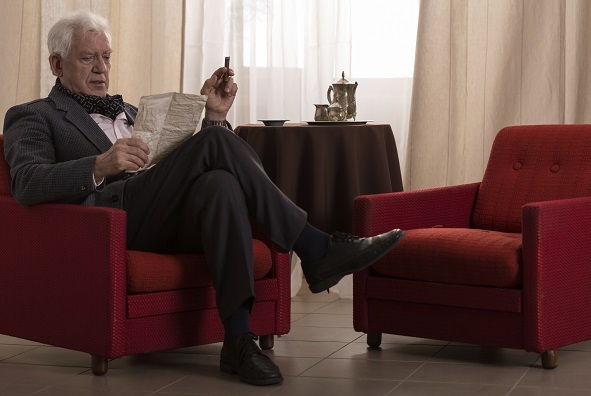 In places like New York and Los Angeles, many retirees are forced to either work during retirement, find a new home or live frugally on a strict retirement budget. None of those may appeal to you, but unless you’re a millionaire they may be your only options. Try SmartAsset’s retirement calculator to find out how much you should be saving. To calculate the average savings needed to retire in U.S. cities, SmartAsset first looked at data from the Bureau of Labor Statistics (BLS) on the average annual expenditures of seniors throughout the country. So, according to the BLS seniors spend an average of $10,907 annually on housing, $5,314 on food, $5,439 on healthcare and $15,589 on everything else (including entertainment, transportation and utilities). That adds up to total annual expenditures of $42,557. SmartAsset applied cost of living data from the Council for Community and Economic Research to adjust those national average spending levels based on the cost level for each expense in each city. For example, in a city where housing is twice as expensive as the national average and food is half as expensive, a senior would need $21,814 for housing and $2,657 for food. Combining each category, we generated the spending required in every city to maintain the average standard of living for seniors. Maximize your savings with SmartAsset’s 401(k) calculator. We then ran those spending numbers through SmartAsset’s income tax calculator to calculate the pre-tax income required to afford that lifestyle. We assumed seniors would receive $17,189 in Social Security income (the national average) and that the rest would come from savings—either a 401(k) or an IRA. Lastly, we calculated the total savings needed at retirement in order to generate that level of income for 30 years. We assumed a real interest rate (interest minus inflation) of 2%, reflecting the typical return on a conservative investment portfolio. The map below shows the savings you would need at retirement in America’s least affordable major cities for retirees. New York City is a lovely place, with lots of great restaurants, music and art. It is not, however, a great place to retire—unless you’re a multi-millionaire. In order to retire in Manhattan while maintaining the standard of living enjoyed by the average retiree, one would need $2,250,845 in savings. The largest cost for seniors in the Big Apple is housing, which is four times as expensive in Manhattan as it is in the rest of the country. A senior in Manhattan would need over $47,000 annually just to cover housing expenses. The tax rate is another budget-buster for retirees in New York. When combining the federal, state and city income taxes, seniors in New York City could face an effective tax rate of 31% on their retirement income, over twice that in most of the other cities in our study. Retirees in the New York area might be better off fleeing for one of the outer boroughs. However, even those aren’t cheap. SmartAsset found that a retiree in Brooklyn would need nearly $1.5 million in savings. Endless summer, beautiful sandy beaches and delicious food: Honolulu is the ideal place to retire – if you can afford to do so. SmartAsset found that retirement in Hawaii would require $65,822 annually in disposable income, and (given Hawaii’s relatively high income taxes) pre-tax income of $91,451. Over $70,000 of which would need to come out of your retirement savings every year, meaning you would need $1,663,195 at retirement for your savings to last for 30 years. Why is Hawaii so expensive? Housing is one major reason. SmartAsset found that a senior living in Honolulu would need to spend about $28,000 annually to keep a roof over her head. Food is also a big cost, taking an $8,200 bite out of a Honolulu retiree’s budget each year. After several years of skyrocketing home prices and rental rates, housing costs in San Francisco are now three times the national average. That means someone planning on retiring in San Francisco should expect to spend over $30,000 annually on housing alone. When accounting for other expense like healthcare (20% more expensive in San Fran) and groceries (23.5% more expensive) the average retiree would need an annual gross income of $83,616 to live in San Francisco, about $66,000 of which would have to come from a 401(k) or IRA. That would require a starting balance of $1,487,718. But at least it never snows! Orange County has some of Southern California’s best beaches and nicest neighborhoods. Costa Mesa, Huntington Beach and inland cities like Irvine would all be great places to live in retirement. Doing so, however, may only be an option for millionaires. Along with housing, one of the major costs for retirees in Orange County is transportation. While the typical retiree spends $6,747 annually on transportation, in the OC, where transportation costs are 23% higher than the national average, that expenditure would rise to $8,360. Located less than 40 miles from midtown Manhattan, Stamford is an obvious choice for residents of the New York metro area looking for a lower-cost alternative to New York City. While retirement in the Stamford area would certainly be less expensive than in New York, it wouldn’t be cheap by any means. In fact, to maintain the average U.S. standard of living for retirees, you would need over $1.13 million in your retirement account if you were planning on living off of savings and Social Security alone. The average annual Social Security payment is $17,189, an amount that makes a big difference in the budget of a typical retiree. How big? SmartAsset calculated that a retiree receiving that average Social Security distribution each year would need $1,206,300 in savings to retire in Washington, D.C. Without social security, that same retiree would need an additional $400,000 in his 401(k) or IRA to live in the nation’s capital for 30 years. The good news for retirees (current and future) in the Oakland area: an East Bay retirement is far more reasonable than one at the other end of the Bay Bridge. The bad news? It still isn’t cheap. A retiree in Oakland would need her savings account to generate $46,971 in annual income to live off of savings and Social Security alone. That, in turn, would require an account balance of $1,051,979 upon entering retirement. San Diego is one of four California cities in which the typical retiree needs at least $1 million in savings if he or she wants to live off savings and Social Security alone in retirement. As in the other California cities, housing is the major factor behind the high cost of retirement in San Diego. According to the Council for Community and Economic Relations, the cost of housing in San Diego is double the national average. That means a retiree in San Diego would need to spend about $22,000 annually on housing alone to maintain the standard of living enjoyed by the typical retiree in the U.S.
Boston received a record-breaking 110.6 inches of snow this past winter in a series of blizzards that shut down the city’s public transportation for weeks. That kind of icy inconvenience is one reason you might not want to target Boston for your retirement, but here’s another: you would need $1,015,740 in savings in order to maintain the national average standard of living as a retiree in Boston. That breaks down to $45,353 annually in income from your 401(k) or IRA, on top of $17,189 from Social Security. If you want to retire in Los Angeles, you’d better have a Hollywood-sized nest egg. SmartAsset found that a typical retiree in LA would need $994,377 in savings at the start of retirement to maintain an average standard of living for 30 years. Along with taking a look at the country’s ultra-expensive big cities, SmartAsset wanted to find places where it’s possible to retire comfortably with relatively modest savings. 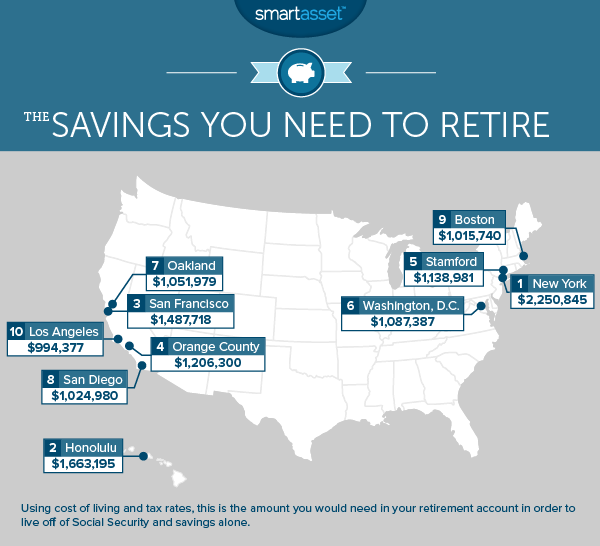 The map below shows the cities in our study where you need the least in your savings account to retire. Located on the southern tip of Texas, 70 miles from the Gulf of Mexico, McAllen is known as the Texas Tropics because of its year-round tropical weather. Unlike Hawaii, however, you don’t need to be a millionaire to retire in the Texas Tropics. SmartAsset found that a nest egg $369,857 would be sufficient to enjoy a comfortable retirement in the city of McAllen. According to its welcome sign, Ashland is the “World Headquarters of Nice People.” Retirees moving into the area can be assured of a warm welcome from their new neighbors, as well as a peaceful – and affordable – lifestyle. SmartAsset’s analysis found that a retiree in the Ashland area would need just $17,125 annually in investment income (in addition to $17,189 from Social Security) in order to enjoy a normal standard of living. 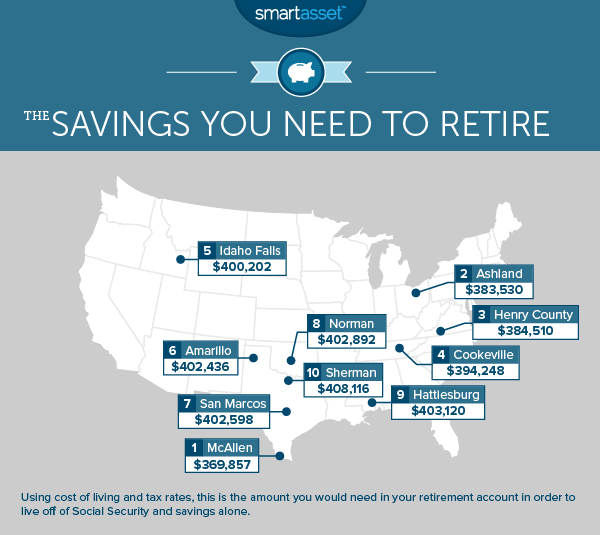 A retiree with $384,510 in a 401(k) or IRA could live in the Martinsville-Henry County area off of savings and Social Security alone. According to the Council for Community and Economic Relations, housing in Martinsville is more than 25% less expensive than the national average, while health care costs 9% less. That means big savings for seniors, whose two largest expenses are housing and health care. Cookeville is located between Nashville and Knoxville in central Tennessee. Since the state of Tennessee has no state or local income taxes, retirees would only pay taxes at the federal level. At the same time, they would enjoy a cost of living 15% lower than the national average. As a result, SmartAsset’s analysis found that a gross income of $34,792 would be sufficient for a comfortable retirement in Cookeville. For seniors who want to enjoy an outdoor lifestyle, Idaho Falls may be the perfect place. The city is less than two hours from both Yellowstone and Grand Teton National Parks, as well as three hours from Sun Valley, Idaho. And consider this: housing costs in Idaho are about 40% lower than the national average. Indeed, a retiree would need just $400,202 to live in Idaho Falls through retirement – although you might want to save a few dollars extra for your outdoor excursions! There is no state income tax in Texas, and retirees living in Amarillo would pay an effective tax rate of just 10% – all of it federal. Combine that with health care costs in Amarillo that are 10% lower than the national average and you have a very affordable place for retirees looking to live off savings and Social Security alone. San Marcos is part of the Austin metropolitan area, and is one of the fastest-growing cities in the country. One of the main reasons for that growth is the city’s affordable housing. SmartAsset’s analysis found that a retiree in San Marcos would need to spend just $8,202 annually on housing in San Marcos, saving $2,700 as compared to the national average housing expense for seniors. While the average senior spends $5,314 annually on food, a retiree in Norman could spend less than $4,500 without sacrificing either quality or quantity. In all, the low cost of living in Norman would generate savings of more than $10,000 annually for retirees. SmartAsset’s analysis found that with a nest egg of $403,120, a senior in Hattiesburg could live comfortably off of Social Security and savings alone. That is based off of annual expenditures of $31,797 required to maintain the national average standard of living. Among the things retirees in the Hattiesburg area might enjoy doing: catching a show at the historic Saenger Theater, visiting the University of Southern Mississippi Art Gallery and watching the annual Hattiesburg Mardi Gras parade. Retirees living in the Sherman area could expect to save about $600 annually on health care (as compared to the national average) and $2,700 on housing. Over the course of a 30 year retirement, those savings add up. In total, a person entering retirement with $408,116 in a 401(k) or IRA would be able to enjoy a comfortable retirement in Sherman.